A frame without a picture - it's something I see often and am intrigued by. In the absence of a picture, it goes against the grain and begs you to recognize the frame itself as the object of beauty. And as you know, I love anything that catches your sense of intuition off guard when it comes to design. But of course, I worry that if I tried this in my own home that less design inclined guests would look at it with a puzzled mind and think to themselves, 'what bizarre taste that Crystal has,' - similar to the reaction I get when people see all my books turned backwards with the pages facing out on my bookshelf. So I'd like to know, what do you think of a frame without a picture? Yay or Nay? It's a great idea! I love it. I'd like to try it in my appartment! i like the idea + have seen some beautiful interpretations but ultimately it's not for me...it takes up space i could otherwise use for art (by me, my family/friends, from the flea market, etc) & i couldn't live without tons of art on my walls. I'm not sure. It almost looks a little eerily ghostly, but that in itself looks kind of neat, too. I think I'm too devoted to photos to give them up, though. I would LOVE to see your backwards books!! I think it works if you do it in mass like you've shown in these photos. 2 or 3 wouldn't look right, but 5+ could really make a statement. And the monotone color also helps the look seem purposeful. i've always done empty frames in my homes and i love it! Oh let's have a photo of your books arranged blank side out! I've never seen that and would love to observe the effect. Love it empty, it creates an exciting unpredictable tension! I love how unique and individual everyone's taste is! Am really enjoying all this feed back! @Ruth and @Mise, I will try and take a pic of my bookshelf and send it your way! There is something intriguing and intellectual in this look. I think I prefer the black and white. Have you seen the restuarant Eve on Wabash here in Chicago? The best version of empty frames evah! For spacious apartments and houses where you can create that gallery look, yes, definitely! I like the white on white. I've seen a clever lady use this concept in her house to then use as frames for her childrens paintings. Each new one goes up (non marking adhesive of course) & when they're full, the child selects which one comes down. I absolutely love it! amazing idea! and the first pic - very my style! love it to bits! loving the all white frames w/ the white walls. Definite YAYYYYYYY! It is uncanny how eye-to-eye we are. You are the established blogger and I am just now getting mine up and running… so I hope my blog doesn’t come across as a total copy cat, lol. Not only did I used to have a slew of frames hung salon style on my wall in my room that I spray painted all the same color (I took them down to hang my diploma, I spent a fortune to have it framed in this goddy-gold “in a good way” frame with this lovely grey mat and gold fillet, it needed to be front and center) but I also have a large number of them in my archives as well. 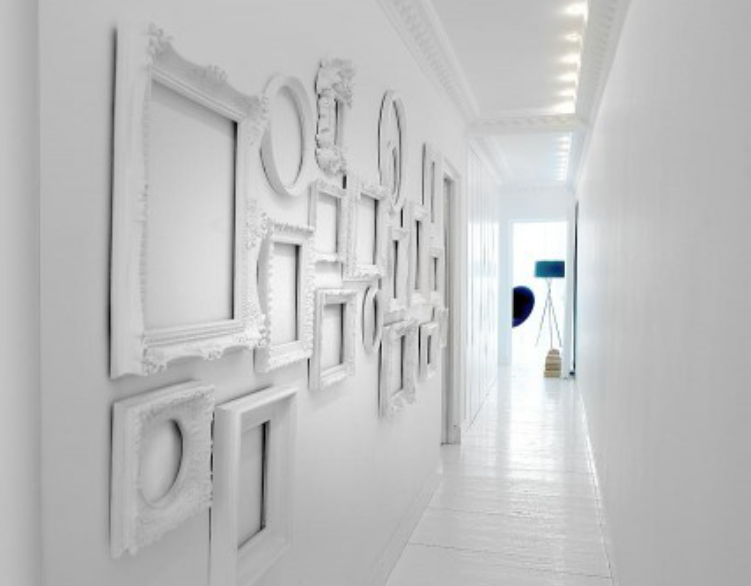 I love empty white gilded frames on a white wall. Theres something almost mysterious about it from the lack of images and glass. I actually have several in my living room right now! I scored a box of old frames from a friend and spray painted them, either white or a gorgeous shade of teal, but I haven't quite figured out what to do with them (lean them on shelves, put them on the walls, etc). Thanks for the inspiration!! 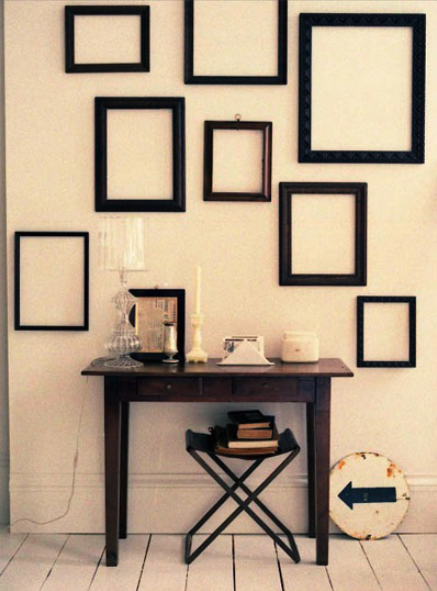 i love the idea of empty frames! my friends think i'm weird...and they hate coming over to borrow books because they can never find the one they want. but i like it. my books. my shelf.